We’d love your help. Let us know what’s wrong with this preview of 1-800-Mischief by Dawn Blair. The first novella in The Loki Adventures series. Loki, Norse god of mischief, has been banished to earth for a crime he may or may not have committed. But he has a plan to regain his powers and return to Asgard to prove his innocence. If he isn’t stopped first. While working his mission to save humanity, Loki discovers a plot against him. Who would dare to call up Loki’s wrath The first novella in The Loki Adventures series. Who would dare to call up Loki’s wrath? Why now? It all starts when he goes to help a girl with her abusive boyfriend who happens to be a transdimensional being. But as he searches for the reasons as to why this particular girl was chosen as a target, he finds himself lured into a bigger trap, one intended on breaking his banishment which would leave him powerless and within the grasp of his unfriendly kinsmen on Jotunheim. 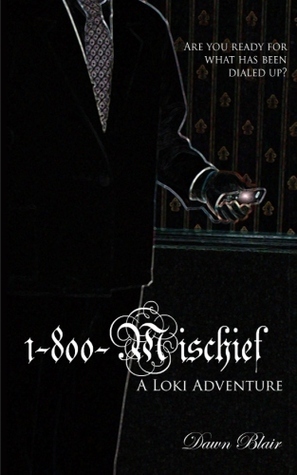 To ask other readers questions about 1-800-Mischief, please sign up. Your cell phone… I live like a millionaire thanks to it and that annoying little contract which always costs you more than you think it will. It doesn’t matter which carrier you’re with. They really are all the same for they are owned by one person: me! So, go on, love your cell phone, text away, check your Facebook posts, tweet more, and cry, cry, cry over your bill. I know you can’t live without it. Complain all you want, but you’ll renew your contract, you always do. We both know it. Now that the truth is out, you can stop hating me or start. Whichever, it makes no difference to me. After all, the trick’s on you! First comes the call. Second comes the information gathering. Third comes Loki barging down the door. I laugh at my own little joke as I walk through the college parking lot. I like to think that’s how the sequence always works. Unfortunately, it rarely does. You see, those coming to this dimension usually want to stay. Imagine the audacity! Still, it helps me get focused on the simplicity. Why make this harder than it should be? I pull out my cell phone, a smartphone of course and way more sophisticated than one you could ever think of getting, and call up the information I need. Within moments, I have the exact information I’m looking for. One has got to admire the genius of Google. They weren’t even gods when they got the idea, though they will be when I get my full powers back. Gods do not feel fear. But they do get angry. I grow tired of ‘let’s trick the Trickster’ and decide to put this to an end. If they want to mess with me, they’ll find themselves having a bit of Loki’s mischief right back at them. Let’s play! This short story has only one flaw: it's only 80 pages. Oh dear, why all good things have to end? Being a huge fan of mythology (Norse, Greek, Egyptian, you name it) and a big fan of Loki, I enjoyed this book very much! Dawn Blair managed to create a world where mythological creatures, gods and humans all live together. And it worked well! It was funny to see how they all tried to fit on Earth (or Midgard) and adapt: sirens become waitress, ancient heroes are bartenders, fauns are bouncers and pu This short story has only one flaw: it's only 80 pages. Oh dear, why all good things have to end? Being a huge fan of mythology (Norse, Greek, Egyptian, you name it) and a big fan of Loki, I enjoyed this book very much! Dawn Blair managed to create a world where mythological creatures, gods and humans all live together. And it worked well! It was funny to see how they all tried to fit on Earth (or Midgard) and adapt: sirens become waitress, ancient heroes are bartenders, fauns are bouncers and punished gods are private detectives. How cool is that right? After being punished and banned to Midgard, Loki (our favorite Trickster) has to earn the right to go back to his realm by helping humans. But someone is trying to trick the trickster. Loki is a funny and likable character. I was totally caught up in the story and couldn't put it back. I can honestly say that I bought the second book via my Kindle right after the first book! Many years ago the Norse god Loki was punished to serve time here on Earth protecting humans from trouble created by the other gods of the different Pantheons. With every human he rescues he gets one more step closer to finishing his punishment. Yet some one has decided to trick the trickster, by stealing his tokens of good deeds possibly forcing Loki to have to start all over. This was a fun read. I have always loved the god Loki, even once named a cat after him. I liked the way the author pres Many years ago the Norse god Loki was punished to serve time here on Earth protecting humans from trouble created by the other gods of the different Pantheons. This was a fun read. I have always loved the god Loki, even once named a cat after him. I liked the way the author presented the Norse god. There are other gods in this story as well. From what I can tell this is just one of a series of short stories regarding Loki and his deeds. Readers should know that the ending of this short story is a cliffhanger. I look forward to reading more of his adventures. This was just what I was looking for at the moment, someting short and fun to read!! I love Norse mythology and that makes this an awesome read! Loved it! Loki was just perfect and exactly what I wanted to read, the story could have been one of the original lore, as all parties seem to mislead each other, like they always do in Mythology. All in all well done! And I am looking forward to reading more of Lokis story! My music suggestion for this read, or what Loki could have listened to: Anything This was just what I was looking for at the moment, someting short and fun to read!! I love Norse mythology and that makes this an awesome read! Loved it! Loki was just perfect and exactly what I wanted to read, the story could have been one of the original lore, as all parties seem to mislead each other, like they always do in Mythology. All in all well done! And I am looking forward to reading more of Lokis story! If you're a fan of Loki, and who isn't, you'll enjoy this story. I'm going to look into more of his stories by Dawn Blair. This was an extremely entertaining read. Mixing elements of Norse mythology, urban fantasy, and classic detective fiction, it was right up my alley! I got a signed copy of this book through a Goodreads giveaway, and was impressed by how quickly the story drew me in. Loki is an immediately likable protagonist. My only problem with the story: it's so short! It got me hungry for more, and then ended. It seems more of a prologue to the continuing Loki adventures. I am eagerly awaiting the next installm This was an extremely entertaining read. Mixing elements of Norse mythology, urban fantasy, and classic detective fiction, it was right up my alley! A very interesting idea - Loki is banished to Midgard (Earth) instead of Thor for a crime he might (for once) not have committed. Apparently, he's been here a while sending transdimensional beings back where they came from and helping us poor mortals out in the process. It's told in the first person, but Loki's personality hasn't really come through yet. Hopefully, we'll see more in the next book. Lovely write although it feels like an aperitif leaving one hungry for the full meal. It's a good intro and almost a prequel and definitely Loki is the star of the show. I love how they match Norse mythology with the modern world and can only begin to wonder on what other adventures are in store. Great work and I'll be checking out the other books to see what other mischief Loki manages to get himself into. I found this to be an interesting story but I feel that the writing could be better. Some sentences and descriptions did not make sense and I noticed at least one typo. The author also tends to repeat the same word/phrase several times in the same paragraph and it makes reading awkward. Other than that I enjoyed this story and I feel that it could have potential as a full length novel. OMG! This book is absolutely fantastic! I'm totally in love with her version of Loki! This book pricked interest. Definitely has more to come with this story. Will have to read the next book to find out what happens next. Very promising, but alas! too short!